The above is a little old (PotBS…) but is still often used. EVE, compared to most MMOs, is indeed a tough game to get into and stick with. However in terms of tutorials and explaining the basics of a very complex game, I believe what CCP has in place today is about as good as it’s going to get, and all of the UI enhancements of late have lowered that bar as well (it’s still higher-than-average, but at this point that’s due more to the game’s complexity than the UI getting in your way). What keeps the above image true is the sandbox nature of EVE; by design it does not hold your hand and show you all of the pretty sites like a themepark, and for many that lack of guidance results in them getting lost and ultimately leaving. Of course it’s tough to admit the failure is on the player, which is why more often than not you will get skewed or simply inaccurate accounts shortly before or after someone leaves (assuming they don’t just fade away without a peep). One example I’ve seen play out over and over is the ambitious miner. A new player to EVE will go down the mining career path and plan to fly the biggest and best ship for mining. They initially enjoy the slower pace, as well as the ISK and the small market gameplay that goes with it. They are playing EVE like a themepark, ‘gearing up’ and working towards that BiS ship. Problem is, once they hit that goal, or get close enough to see what hitting it will be like, they get bored. For them, progression has stopped or slowed to a crawl, and they are left wondering “now what?” If they don’t come up with a good answer, they are done. The same cycle exists for the high-sec mission running when he gets into a faction battleship, or for the trader once he gets ‘enough’ ISK. The problem with all those goals is they are not only short-sighted, but they also just provide you with a tool (ISK) to do ‘something’ with. Mining/mission/trade efficiency is not itself content. The reason you mine or run those missions is you can then turn around use that ISK to do X. If you can’t fill in X, and keep filling in X once your first initiative is complete or gets stale, you will drift away. The advantage EVE has over anything else on the market is the sheer number of choices, and the depth that many can go to. And in EVE, the biggest source of X is other players, be it alliance-level combat or working with other traders to corner a market or create a new hub. As you get more involved, bigger and longer-term goals start to creep up, and you end up having TOO much to do vs having nothing. This is easily identified by your current training plan; if it’s full and you had to make tough choices, you are sucked in. If you are training aimlessly or just finishing stuff up, you likely lack solid goals (or have a super-advanced pilot, but EVE veterans tend to stick around as the metrics have shown in the past). I don’t really think the problem can be fully solved, at least not at a mass-market scale. This, ultimately, is why the MMO genre is a niche; the number of people capable and willing to find, set, and follow-through on goals is limited. At the same time, the formula itself clearly works, as EVE’s upcoming 10 year anniversary attests to. Ultimately it’s all a balance between handholding and mass-market, and inversely retention and longevity. If you are interested in selling a ton of boxes and getting a huge one-month pop, you go one way. If you aim to entertain for 10+ years, you go in the other direction. The middle is either a gold mine or a total disaster, depending on countless factors, not all of which you can control. This entry was posted in EVE Online, MMO design. Bookmark the permalink. Unless you’re going with the full industrialist goal, and get your fun from that, the game really is rather boring if you’re not involved in 0.0/meta shenanigans. And the time you need to invest to get there puts most people off. The problem is that this equation is delicate and if you touch it in any way, chances are it will all go to hell. It has to remain as it is to remain EVE. You are letting CCP off the hook for some glaring issues in the early and mid game. It’s particularly so if you are fresh from some sparkly sandbox with tons of scripted content, mobs every 5 feet and grass/trees blowing in the wind. Eve is very beautiful especially with the nebula changes last year but there is almost nothing going on in space as you start and progress your early pilot. This is exacerbated by the quests being 100% instanced ie all in deadspace. There are reason for it evolving this way but it does have an affect on how people feel space around them is occupied (like when wow added instancing to its own quest zones, I bet you have a post about that ;) ). Trips to jita or the other trade hubs should probably be emphasized to early players. It’s pretty eye opening being in Jita and seeing all the commerce. Maybe a cargo scanning mission, so that new players can get an idea of the scope of the economy as they watch it go in and out of Jita? I think CCP should very aggressively expand the Incursion style play into newbie zones. Make use of frigate logis with 2-3 man sites. Make them feel like they are in the middle of something as the different factions vie for control of some newbie zones. Anyway, I think to some extent your post is getting into very typical bittervet blindness, i.e. “it’s all the fault of the dumb people who can’t handle the learning curve”. CCP could be doing a much better job without dumbing it down even a little bit. I agree the PvE can be expanded upon (it always can be), and hopefully the AI update coming up is just the first step (vs the only step). I think what I’m really suggesting is probably things as banal as scripted npc fights around the stations as newbies undock. Make them see pewpew right away even if it’s hokey. Make some non-deadspace missions as part of that pewpew right around the stations. More visual and interaction stimulation earlier and often. I believe it’s what is really holding Eve back from it’s next 50% growth. Later on, aggressively push them into factionwarfare instead of mission running etc etc. That is not really true. Go run missions in an active low sec system and see how quickly somebody scans you down and jumps in to gank you. That said, mission sites might as well be instanced most of the time, because the little corner of space you end up playing in isn’t really of interest to most people unless you are flying something really expensive that they want to gank for possible drops. Heh, I when I started playing, the first agent they sent you to after the brief tutorial was in Jita. It wasn’t so overwhelming at the time, though even back then Jita would occasionally overflow and get locked down. Oh, and that agent in Jita, he sent me on “Worlds Collide,” certainly one of the most confusing missions you could possible throw at a new player in a Bantam. Educating the mission bears on EVE aggression mechanics and collecting their tears after the lesson is over is its own reward. Any shiny loot is just a bonus. I’ve always thought there was a good dose of luck in whether a player is able to hook up with a compatible guild fairly early on in a game, That makes the learning curve a lot easier and the game a lot stickier. Yeah, you can improve your chances by reading up and checking forums for guild adverts but none of those guarantee that the guild will a) be recruiting or want to recruit a newbie or b) will have an atmosphere that suits. I guess this is where forum based guilds like Goons really do well, because their people don’t need to hope to find a guild that works for them. Does anyone have any advice for someone who is interested in EVE because of its economic aspects and want to be involved in the manufacturing/industrial aspect of it? I’ve read about the hostility people have for newbie characters (on the assumption that they aren’t actually new but are spies), so it makes me a little hesitant. Find an industry-focused Corp. There are plenty of them, and the good ones will be able to quickly spy-check you and find that you are clear (unless you are a spy of course). Once in, the vets will be able to teach you some of the tricks, and after that it’s generally up to you to find your market niche and make it work. There is no one ‘right’ way to do indy in EVE. What do spys have to do with EVE? Then there is another group of EVE players, who tried WH/small PvP/large PvP/whatever and just don’t play a whole lot anymore, because X lacks excitement for the amount of work you need to do. Also, I wanted to mention that it seems when you’re talking about MMO, you’re talking only about the subset of the genre you’re interested in. It’s like proclaiming strategies are niche product because 4x games are. I can see you discarding other games as not worthy to be called MMO, but this way you’re actually inventing your own terminology. 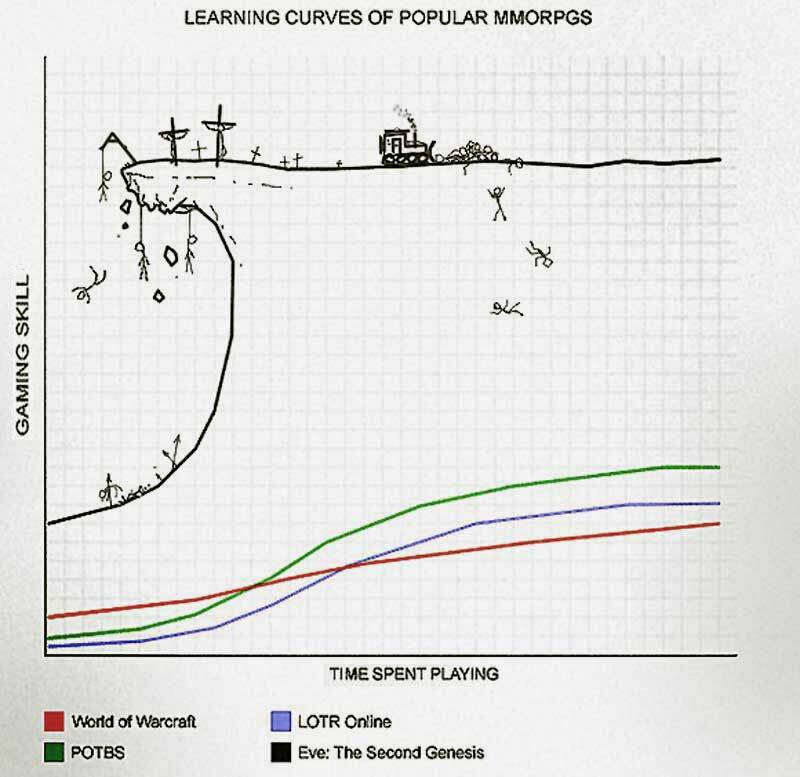 I’m just using the original definition of MMO, rather than the average of the titles studios slap the term onto today. Which one would that be?This one http://en.wikipedia.org/wiki/Massively_multiplayer_online_game and this one http://en.wikipedia.org/wiki/Massively_multiplayer_online_role-playing_game only mention the presence of a shared game world. I may be also interesting interesting to look at ‘game types’ section in the former article. Hitting 80 in GW2 might as well be a giant “game over” announcement, since progression stops. No one has bothered replying to my comment regarding “spys” in EVE, other than to be snarky. (I have never played EVE, just curious because I know nothing about the game) What do spys have to do with the game and what are they spying on? The guild they were interested in? If so, why does that matter? Spying on the MMO? If so, why does that matter? What is being spied on? They are spying on the corp or alliance (i.e. the guild). Examples are from letting the corps enemies know where their groups are and what their composition is (e.g. letting the enemy drop combat ships on a mining run), up to working themselves into a position of trust then looting the corp hangars or even disbanding the corp/alliance. What I find amazing about all this is the behavior that arises from sandbox games is often utterly alien to theme park players. A virtual world that was approachable enough to get a large portion of the market to let go of their trepidation and hop in the box would make bank. If you can’t fill in X you sort of fade out and leave. been out of eve for a few months for that exact reason, I had no “x”. All roads lead to Rome, in Eve all roads lead to PvP, killing other players ships is surely the true X, otherwise you do get bored.